Vuckovic, who is one of the world's leading researchers in the field, said quantum computing is ideal for studying biological systems, doing cryptography or data mining – in fact, solving any problem with many variables. "When people talk about finding a needle in a haystack, that's where quantum computing comes in," she said. Marina Radulaski, a postdoctoral fellow in Vuckovic's lab, said the problem-solving potential of quantum computers stems from the complexity of the laser-electron interactions at the core of the concept. "With electronics you have zeros and ones," Radulaski said. 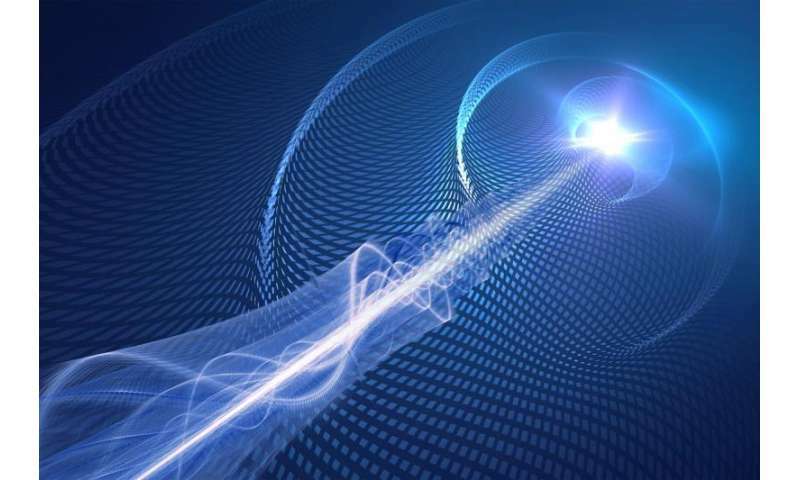 "But when the laser hits the electron in a quantum system, it creates many possible spin states, and that greater range of possibilities forms the basis for more complex computing." Harnessing information based on the interactions of light and electrons is easier said than done. Some of the world's leading technology companies are trying to build massive quantum computers that rely on materials super-cooled to near absolute zero, the theoretical temperature at which atoms would cease to move. "To fully realize the promise of quantum computing we will have to develop technologies that can operate in normal environments," she said. "The materials we are exploring bring us closer toward finding tomorrow's quantum processor." The challenge for Vuckovic's team is developing materials that can trap a single, isolated electron. Working with collaborators worldwide, they have recently tested three different approaches to the problem, one of which can operate at room temperature – a critical step if quantum computing is going to become a practical tool. "We are trying to develop the basic working unit of a quantum chip, the equivalent of the transistor on a silicon chip," Vuckovic said. In a recent paper published in Nano Letters, her team focused on color centers in diamond. In nature the crystalline lattice of a diamond consists of carbon atoms. Jingyuan Linda Zhang, a graduate student in Vuckovic's lab, described how a 16-member research team replaced some of those carbon atoms with silicon atoms. This one alteration created color centers that effectively trapped spinning electrons in the diamond lattice. Vuckovic's team knocked certain silicon atoms out of the silicon carbide lattice in a way that created highly efficient color centers. They also fabricated nanowire structures around the color centers to improve the extraction of photons. Radulaski was the first author on that experiment, which is described in another NanoLetters paper. She said the net results – an efficient color center, operating at room temperature, in a material familiar to industry – were huge pluses. "We think we've demonstrated a practical approach to making a quantum chip," Radulaski said. But the field is still in its early days and electron tapping is no simple feat. Even the researchers aren't sure which method or methods will win out. "We don't know yet which approach is best, so we continue to experiment," Vuckovic said. Since electrons travel at 2/3 the speed of light, optical computing must have innovative design architectures to process data at significantly better computing speeds. Optical mode interference effects could be an advantage, with refractors, specific wavelength absorbers, order angles with varying peak detection, etc., and not just a reproduction of standard logic based codes. I'm beginning to wonder if usable quantum computing is going to always be 10-20 years in the future like fusion power. My exact thought ! You can find 100s of 2000s research paper which promised great technological breakthroughs for today. Yet none of it came out. Hype sells. You have to read these papers. Each solves a small part of the problem. Science isn't like it's portrayed in Hollywood movies where there's "one breakthrough invention" and then everything is just engineering from there. There's a lot of small (and large) problems to overcome to make quantum computing an everyday reality. In the end it's also pretty irrelevant for the average consumer. Quantum computers are good at some tasks which conventional computers are bad at. But there are also several areas where conventional computers are way better than quantum computers. Just because you have a quantum computer doesn't mean you'll get better performance for the stuff you do now (surfing, games, video, .... ). There's actually almost no application in your home that could be made to go noticeably faster/better if it were run on a quantum computer.